A fun and creative work environment that builds happy and productive employees! Increased sales and profits as satisfied employees create satisfied customers! Team morale that fosters communication, reduces stress and conflict and enhances the overall quality of your company! Tim Dumas brings over 25 years of experience in the business and entertainment world to help clients find unique ways to improve creativity, increase sales and profits, and use humor to develop fun and productive work environments. Trained in the United States Air Force and Midwestern State University, Tim has been a clinical laboratory scientist, manager and consultant in the medical field from which he gained his fondness and understanding of empathy; a key concept in his presentations that will help your business enhance customer and employee relations. Parallel to his day job, Tim practiced and studied his true love, making people laugh. Professional Magician, Comedian and a graduate of Artistic New Directions in New York City, Tim’s training in the art of humor, improvisation, and communication will have your group engaged and learning new skills to enhance all aspects of your business. Why "Tim the Lab Guy"?! Well for many years that's what Tim heard . . . "I don't know. Go ask Tim the lab guy!" With over 25 years of knowledge and experience as a clinical laboratory scientist, manager, and lab consultant, Tim Dumas came to be known as "The Lab Guy". Satisfied clients continue to enhance their employee morale, quality of patient care, and practice revenue with Tim's unique and creative professional workshops. Humor and magic engage your group as they learn valuable tools to enhance productivity and streamline their talents and time. Imagine . . . a scientist who is educational and entertaining! Looking for helpful medical sales info?! 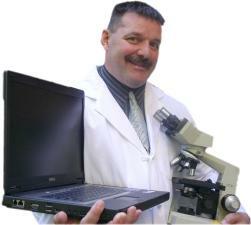 Check out Tim the Lab Guy's featured recurring column in "Repertoire" medical sales magazine. Click Here to view the debut in the Febraury Issue of "Repertoire"
Enhance Patient Care, Productivity and Practice Revenue! Tim Dumas was informative, motivational and very entertaining! His delivery was impressionable and created lots of great "take-aways". He attained the highest scores of all of our fall conference presenters. We would highly recommend him for any group or function. It is with great appreciation of what Tim Dumas has meant to the growth of EnviroFix that I write this testimonial. Tim's presentation of the buying/selling process to EnviroFix has helped increase our sales by 72.7% for the first six months of 2007. His ability to communicate to our employees what and how the sales process works has meant that we as a company have the ability to communicate more effectively what we are selling and understand better what our customers are wanting when they buy. Tim’s tag line “Imagine the Impossible” seemed to be hyperbole to me on first blush, but a 73% increase in sales is all the proof I needed to learn, once I imagine the impossible, all I have to do is find a way to do it! EnviroFix plans to have Tim play an on going role in developing our business. The positive thinker sees the invisible, feels the intangable and achieves the impossible. Tim can demonstrate how to use the word impossible to locate an opportunity instead of finding an excuse.